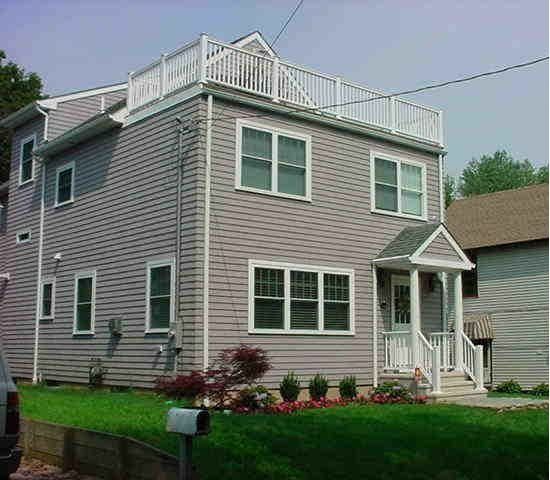 Come enjoy our home built in 2006 located within Hotchkiss Grove: a private waterfront community association featuring a beautiful sandy beach with a large swim area, and quiet roads --the BEST family atmosphere! In addition to the roof top deck that has panoramic views of the Thimble Islands and Long Island Sound, the home has Central Air, High speed Internet access, brand new appliances throughout, finished basement (with treadmill), and an outdoor shower stall (you'll love it!). Master bedroom with King bed, LCD TV, and full bath with a jet tub. What's close by? Everything!! Walk to Famous Lennys Seafood restaurant, Bud's seafood market, and the Indian Neck Liquor store. Take a cruise of the Thimble Islands. Hop in the car for the Owenego Inn (A great place to go have a waterfront drink), fine eateries throughout Branford, Pepe's Pizza (the best!) and the night life of New Haven, Yale University, Mystic Aquarium and Seaport, Foxwoods/Mohegan Sun casinos, and if adventurous, head to Newport or NYC which are both about 1.5 hours away. What isn't close? Stress! Find comfort knowing that the daily grind will be left behind. outdoor shower, We turn the outdoor shower off for the winter months..
All ready for you laptop, Ipad, Iphone, and any other device!! enjoy your morning coffee or an afternoon cocktail! Outstanding property and location and condition. Could not have been happier with the experience. Our family had the privilege of living in this beautiful house by the beach for 5 1/2 months while our home underwent renovations. The house is spacious, bright, impeccably clean and welcoming. Waking to the sound of the waves on the beach, enjoying the sweeping views from the 3rd floor deck and walking to the end of the street to soak up the ocean view was a treat whether summer, fall or winter. The owners were helpful and quick to respond to any questions we had. We highly recommend this comfortable, well appointed home, whether for a short visit or a longer stay! cold months. Access to the beach fantastic! !